She'll be as sweet as sugar in our Candy Swirl Tutu. This gorgeous tutu is made with alternating streams of soft tulle in seven vibrant shades of fuchsia, peach, apple green, turquoise, yellow, blue and lavender. It's then topped off with a gorgeous hot pink bow embellished in the center with a sparkly rhinestone for that extra wow factor. The waist is wrapped in hot pink satin for added comfort and beauty. 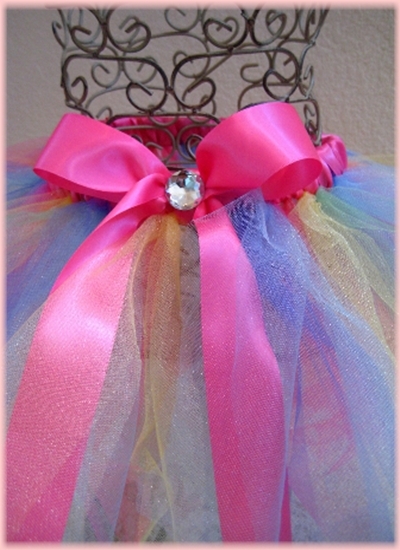 This tutu is perfect for a fabulous birthday celebration or an afternoon playdate with her best friends! 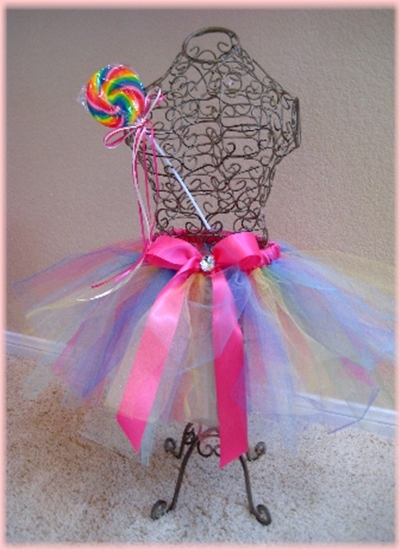 Candy Swirl Tutu shown here in a 10 inch length.